The Big Headed Ant is a very successful invasive species that is sometimes considered a danger to native ants and has been nominated as one of the 100 “World’s Worst” invaders. Big Head Ants has been a pest in southern Florida for many years, and according to reports by pest control operators, it is becoming an even more pervasive nuisance as it displaces other ants. Big Head Ants can be found nesting in disturbed soils, lawns, flowerbeds, under objects, such as bricks, cement slabs, flower pots, around trees or water pipes, along the base of structures, and walkways, where displaced soil is usually observed from the action of ants digging below the surface. It is possible that the increase in Big Head Ant infestations was augmented by several years of excessive hurricane activity in Florida that damaged lawns and killed trees which necessitated the use of increased amounts of sod and other replacement vegetation that may have been infested with this ant. The Big Head Ant does not sting or cause any structural damage, and usually does not bite unless the nest is disturbed, and even then, the bite is not painful. Big Head Ants are a soil-nesting ant that leaves piles of loose sandy soil. Homeowners are annoyed by these “dirt piles” and by ants foraging in bathrooms, kitchens, around doors, and windows, as well as on exterior paved or brick walkways or driveways. Control of Big Head Ants is difficult because the ant colonies are numerous and populations usually extend across property lines. The Big Head Ant receives its common name from the large-sized head of the major worker, or “soldier.” Minor workers are small reddish brown ants. Collier Pest Control Southwest Florida’s Pest Authority has developed a successful 3 step treatment method to eliminate and control Big Head Ants. We will treat your lawn with growth regulator materials to eliminate the development of queens producing new ants and stop the development of the larva stage (the baby ants) from growing up into adult Big Head Ants. With the addition of interior ant baiting, this 3 step lawn treatment will eliminate Big Head Ants quickly and is guaranteed for a full 90 days. Collier Pest Control can continue to keep the Big Head Ants away with a quarterly Big Head Ant Lawn Maintenance program and stop all unwanted Big Head Ants from moving back into your home and lawn. 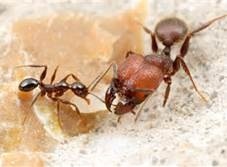 If you live in Naples, Bonita Springs, Fort Myers, or anywhere in beautiful Southwest Florida call 239-455-4300 Collier Pest Control for a full explanation on our exclusive Big Head Ant Lawn Treatments or on any of our services. All our services and most of Florida’s problem pests are also on our web site at collierpestcontrol.com. Remember Florida does not have to be shared with insects.